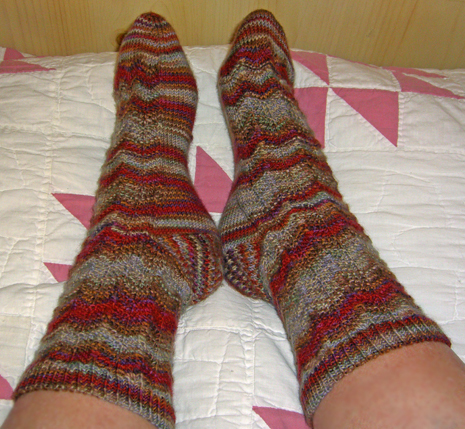 The Rooster Feather Socks were well worth the time it took to finally complete them. I love the way they’ve turned out. They fit perfectly. 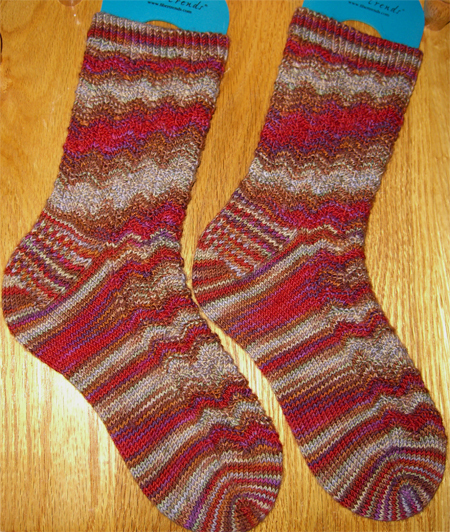 The combination of colorway and stitch pattern was a happy one. And, strangely enough, the socks are nearly identical. The sort-of-chevron pattern I used really does look feathery when used with these colors. I think I’m going to dub this stitch mistake chevron. The double-decrease really should have been a [sl 2, k2, psso]. That would have produced a nice straight line up the decreases, just like there’s a nice straight line up the increases. Instead, I worked the decreases as [sl 1, k2tog, psso]. That produced an alternating left/right line, which really does look more like overlapping feathers. I increase 6 stitches around the ankle, and it was a good thing. I don’t think the socks would have fit had I not. Chevron stitches really do take up a lot of width. The socks is worked in my standard no-pattern sock pattern. I decided to do the heel in Eye Of Partridge stitch to keep with the whole bird theme. I really do like EOP with handpainted yarns. Yarn: Blue Moon Socks That Rock – light ( 100% Superwash Merino/ 360yds/4.5 oz per skein) in colorway Rooster Rock â€” most of one skeins. Pattern: my own standard sock pattern. The heel flap is worked in Eye Of Partridge. M1 increases were used instead of YOs because I did not want the socks to be lacy.